Burdock, a common meadow weed, widely available and easy to grow, was used for centuries to treat a variety of health conditions. However, those uses fade in time; nowadays, burdock is considered as a weed, especially in North America, and most people around the world is unaware of its medicinal and nutritional value. Burdock, an herb endemic to Europe and Northern Asia, has been eaten as part of a regular diet for hundreds of years. The herb was domesticated during the Middle Ages, with the first records of its cultivation pointing to Western Europe. While the medicinal properties of this hardy food crop are still valued by herbalists, they are widely unknown by most people. Lowering blood sugar levels. Medicinal use of burdock can lower blood sugar levels, making it very useful for those with diabetes or other similar conditions. Protecting heart health. Burdock has been shown to protect cardiovascular health, as well as maintain healthy cholesterol levels in the system. Preventing Liver Damage. Some studies have shown that taking burdock medicinally can protect liver health, even preventing liver damage. Regulating Hormone Levels. Burdock may help regulate estrogen levels in the body, especially for women. Eliminating water retention. It releases excessive water in the system by inducing urination. Treating skin conditions. When applied topically, burdock is known for treating certain skin conditions, such as eczema, acne, and psoriasis. Treating the kidneys and gall bladder. Considered a “blood purifier”, burdock helps eliminate toxins in the body. Burdock contains large amounts of non-starch polysaccharides such as inulin, glucoside-lappin, and mucilage. It is also a rich source of vitamins B2 (riboflavin), B6 (pyridoxine), B3 (niacin), C (ascorbic acid), and E (tocopherol). Some of its compounds, like vitamin C, give it antioxidant properties. It is this combination of nutrients that makes burdock such a popular herbal remedy. Burdock also has a cardioprotective action. It has showed to ameliorate vascular dysfunction by allowing relaxation and suppressing inflammation. On the other hand, Burdock owes its hypoglycemic properties on its high phenolic and flavonoid content. The polysaccharides found in burdock root and leaves are regarded as beneficial to human health because of two main reasons: its action as a diuretic and as a blood-purifying agent. Some preliminary studies suggest that burdock induce perspiration (diaphoretic action) and help renew skin tissues, although the full mechanisms of action behind these properties are still largely unknown. Cinnamon and mesquite also have strong hypoglycemic properties, and similar cardioprotective benefits can be found in herbs like olive and flax. Burdock is likely safe for most people when taken by mouth. However, for individuals with allergies or sensitivities to certain flowers, it can cause an allergic reaction. Burdock also looks similar to some deadly poisonous plants so it is not advisable to collect burdock from the wild. Burdock can slow blood clotting, so individuals with bleeding disorders should not consume it unless under medical supervision. For this reason, taking burdock prior to surgery is not recommended. Because burdock lowers blood sugar levels, those who suffer from diabetes or similar conditions should use caution when taking burdock, so that it does not lower blood sugar levels too much. Women who are pregnant or breastfeeding should consult a physician before taking burdock medicinally. Burdock can be prepared in a number of ways. While it is beneficial in its culinary form, burdock's most concentrated components are in its medicinal forms of consumption. Raw. While it is not as common to consume it raw, burdock offers numerous medicinal benefits in this form, including protecting liver health and regulating estrogen levels in the body. Cooked. While this is more common in Japan, Taiwan, Italy, Portugal, Brazil, and Korea, eating cooked burdock can provide numerous nutritional benefits. Along with its high vitamin C content, consuming cooked burdock can protect heart health. Decoction. Burdock stems and roots can be boiled to concentrate their medicinal properties. In this medicinal form, it can prevent liver damage, as well as regulate estrogen levels in women. Powder. Once dried and finely ground, burdock can be added to smoothies or other beverages for an added nutrient boost. It can also aid in digestion and eliminate water retention due to its diuretic properties. Cream. In this water based preparation for topical application, burdock can treat skin problems, such as eczema, due to its emollient properties. Extract. Product of a distillation process, burdock's extract can protect heart health thanks to its cardioprotective properties. Salve. When applied topically as an oil based salve, burdock can treat numerous skin ailments, including psoriasis. Tincture. When taken as an alcohol based tincture, burdock lowers blood sugar levels due to its hypoglycemic properties. Capsules. In its most readily available medicinal form, burdock capsules have numerous benefits, including lowering blood sugar levels thanks to its hypoglycemic compounds, as well as protecting heart health. Fresh burdock is available year round online in specialized health stores and can also be purchased through online retailers. The most common presentation of raw burdock is the whole root. Ground burdock is not as common but it can be found in herbal stores or ethnic markets. POPULAR SOFT DRINKS THAT INCLUDE BURDOCK, SUCH AS DANDELION AND BURDOCK, ARE USUALLY AVAILABLE IN SUPERMARKETS. Burdock supplements are mainly found in specialized health stores and can also be purchased through online retailers, which store a wide variety of brands. 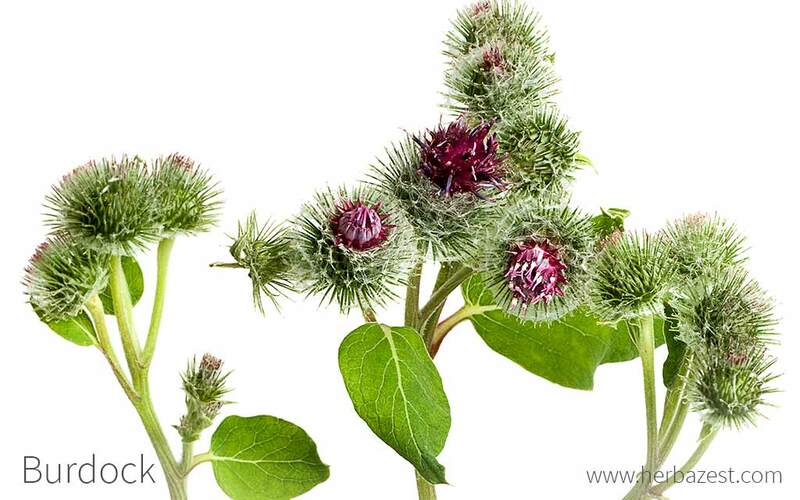 Burdock supplements may come with different concentrations. They are overwhelmingly more common in capsule and table form and are made from powdered burdock. Burdock grows wild throughout the world with little to no assistance, making it incredibly easy to grow. However, in the case of burdock, the more attention you pay to this plant, the more it will thrive, growing deeper roots. For best results, growing it directly from the seed is recommended, since it will produce the highest germination rates. If sown under cold climate conditions or during the fall season, burdock seeds yield best results if planted under one inch (2.5 cm) of soil, although during springtime only half an inch is usually necessary. It is best if burdock is grown in a place with full sun, in well-drained and fertile soil, which should be cleared of stones and rocks to allow roots to develop. Ideally, burdock should be planted in rows with an optimum spacing of six inches (15 cm) between each plant. Soil must be kept moisturized for best results, and the use of fertilizers is recommended in order to accelerate its growth. Roots should be harvested when they are approximately one inch (2.5 cm) thick and 10 inches (25 cm) deep. Fruits should be harvested only when already ripe. Flowers and burrs should be continuously picked to promote new growth. Burdock, also known as gobo, edible burdock, lappa, beggar's buttons, thorny burr, or happy major, is a biennial plant that is commonly grown in the wild. Reaching heights up to 10 feet (3 m) tall, it has large, cordiform leaves that have a long petiole and are pubescent on the underside. It has purple flowers that are grouped in clusters and surrounded by many bracts, each of them forming into a curved hook, which allows them to stick to an animal's fur to be carried for long distances. The small seeds are contained inside of dried, spiny fruits. Easily distinguished by its clinging seed heads, burdock is a member of the Asteraceae family, commonly referred to as the daisy, aster, or sunflower family, which contains more than 23,000 species spread across 1,620 genera. It is an economically important family, providing other herbs such as artichokes, chicory, dandelion, goldenrod, yarrow, and milk thistle. Arctium lappa is one species of the Arctium genus. Native to Asia, Arctium's various species now grow worldwide. The plants in this genus typically have dark green leaves. As well as A. lappa (greater burdock), A. minus (lesser burdock) and A. tomentosum (downy burdock) belong to this genus. First used in ancient Chinese medicine, the seeds were known as niupangzi and were used to expel wind-heat that accompanies cough, fever, sore throat, arthritis, rheumatism, anorexia nervosa, and various gastrointestinal disorders. It eventually spread to Europe, where it was used to treat certain types of cancer, as well as syphilis. In the 1940s, burdock inspired the invention of Velcro after a Swiss inventor grew curious about how it stuck to people's clothes. Leo Tolstoy and Emily Dickinson have both referenced burdock in their writings. Burdock root is an economically relevant herb throughout the world and is popular in certain countries as a flavor enhancer, and in others as a medicinal herb. After a slump in popularity, burdock began garnering more importance during the second half of the 20th century, when it was a key part of the popular macrobiotic diet. Burdock is widely used in cosmetics, shampoos, and hair care products. It is thought by some that rubbing burdock onto the scalp can help towards preventing baldness.